Sadao is forced to use up all the magic he acquired just cleaning up the after-math of the fight with Sariel. Although Sadao opens up a Gate to throw Sariel back to Ente Isla, Sariel just gets warped to Sadao’s MgRonalds instead. So Sariel is effectively stuck in this world—for now. After the big battle, both Chiho and Emi end up getting nightmares: Chiho worries that Sadao might soon return back to Ente Isla, while Emi worries that Sadao might one day turn evil again. Both girls’ suspicions aren’t helped by the fact that Sadao is acting unusually strange. After a bunch of boxes are delivered to the Sadao household, and after Sadao suddenly decides to change shifts, Emi and Chiho decide to tail Sadao to find out what he’s plotting. However, Sadao quickly discovers them. It turns out that Sadao (and Ashiya) were just taking on extra jobs to try paying off the massive debt incurred by Urushihara, mainly for the purchase of the trackers that were put on Emi and Suzuno. However, Sadao didn’t know anything about the boxes, and quickly returns home to confront Urushihara about it. I love the clothes that Emi and Chiho wear here. Sadao and gang find out that Urushihara had been scammed, so Sadao and Emi go to the company offices in person to confront the person behind all this. They are surprised to see… Ashiya! 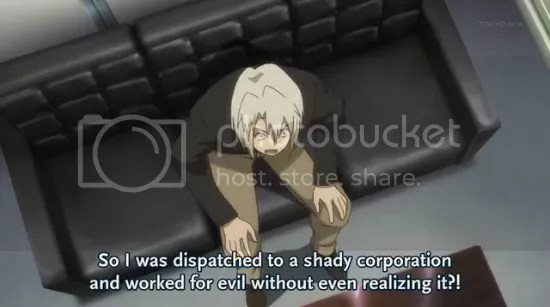 Ashiya unwittingly ended up working for a scam company. Unfortunately, Sadao is unable to do anything to the scamming manager as the manager technically did not break any laws. Thankfully, Emi’s vast knowledge (due to her working as a calls representative) gets the Sadao household out of trouble. For someone so savvy about the modern world and money, I didn’t expect you of all people to get roped into working for a scamming company. After this event, Sadao gets off from his shift to find that it’s raining. Not having brought an umbrella, he’s forced to run home in the rain. 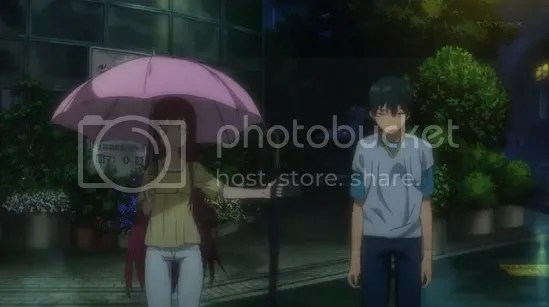 At a stoplight, he finds Emi, who gives him an umbrella. Although the two are still “sworn enemies,” it seems that they’re slowly warming up to each other. This was a good episode, but frankly a terrible way to end a series. NOTHING was resolved! 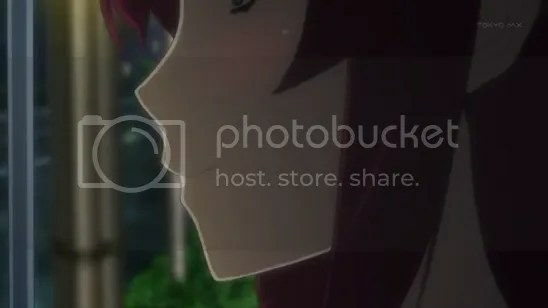 Sariel is still in this world! It isn’t clear if Sadao still wants to return home! Suzuno’s problems were pretty much just neglected this episode! Emi and Sadao’s rivalry is un-resolved! 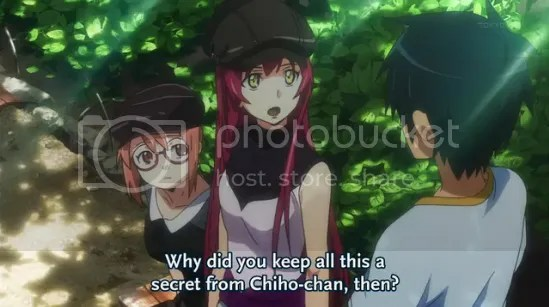 Sadao never even answered Chiho’s confession! So while the episode itself was fairly funny and amusing to watch, if you treat is as the final episode for a series, then it ranks pretty badly. I suppose things are just being left open-ended because the light novel series is still on-going, but man. This is a really disappointing way to end things off. 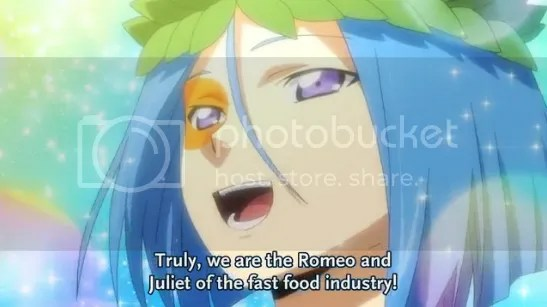 I really, really hope this series gets a second season. Because this episode sure sets things up as if there was going to be one. Whining about this being a terrible final episode aside, the conflict of this episode was very random but… it works. I suppose it’s Sadao’s fate to be perpetually poor because of the anime status quo. Possibly the only good thing about this series was Sadao and Emi’s interactions. It shows that, while they are still fierce rivals, they are slowly becoming better friends. I think it’s nice that Emi worries about getting close to the Dark Lord, since he did somewhat unintentionally/indirectly kill her father. 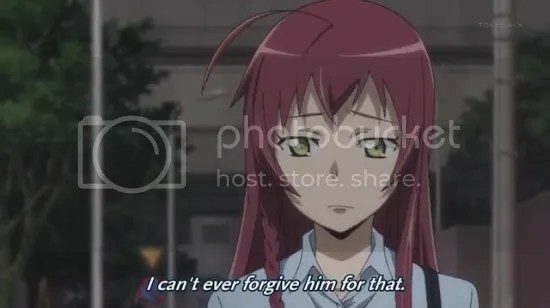 I’m glad to see that her inner conflict isn’t thrown away so quickly, just because it’s the last episode. Unfortunately, there isn’t sufficient time in one episode for the series to really address such a complex issue, so that is yet another plot-point that sadly gets un-resolved. Overall, the good things in this episode are overshadowed so much by the bad things that it just evens out into an… average episode. This series is one that would really benefit from a second season. ((crossing my fingers here)) Even with its open-ended ending, it’s nice that the series does try to wrap-up somewhat. Ultimately, things end where they first began… with rain and an umbrella. 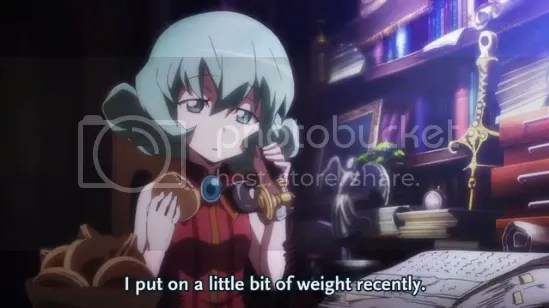 Hataraku Maou-sama is one of the few genuinely funny anime I have seen in a while. Its humor is clever and actually makes me laugh. It does pull a few easy gags here and there, but it in no way abuses it like far too many “comedy” anime I have seen recently. The characters are great, and even though there are quite a lot of main characters in this series, they all manage to be thoroughly interesting and entertaining in their own way. The only big criticism I have for this series is that the ending leaves one feeling unsatisfied. But if you think of the ending as a “to be continued,” then I suppose it isn’t too bad. Let’s just hope that’s the case.